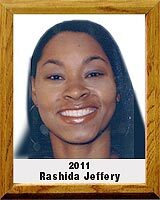 Rashida Jeffery attended Tucson High School from 1988 to 1992 and lettered in volleyball, basketball and track and field all four years. She was captain of the girls’ basketball team her junior and senior seasons. She received a full basketball scholarship from the University of Southern California, where she was part of the Pac-10 championship team during the 1993-94 season. Jeffery played volleyball with the Southwest Volleyball Adult Club Team that won winter league championships in 2007, 2008 and 2009. In high school, Jeffery earned recognition as she was named several times to state and city All-Star teams by the Arizona Daily Star and Tucson Citizen. She won a state championship in the 300-meter hurdles and was runner-up in the 100-meter hurdles. She was inducted into the Tucson High School Badger “T” Club Hall of Fame in 1999. Since 1997 Jeffery has been part of the coaching staffs of boys’ and girls’ volleyball and basketball at Scottsdale Community College and several high schools in Arizona, including Flowing Wells, which won the 2008 4AII girls’ basketball state championship. She is currently head boys’ basketball coach at San Miguel Catholic High School in Tucson. Jeffery also is active in community service with Delta Sigma Theta Sorority Inc. and volunteers with Tucson Youth Football and the YMCA.